Southeast Kelowna real estate accounts for a vast range of Kelowna's most choice homes, including a few of its most luxurious. This extensive area falls south of highway 33, east of Okanagan Lake, and just north of the beautiful Myra-Bellevue Provincial Park. Its elegant, scenic, and semi-rural location affords buyers the opportunity to invest in some spectacular and quintessentially Okanagan properties. Home buyers searching for luxury farmhouses, orchards, wine estates, and vacant lots for custom building can easily find an ideal property in this area. Likewise, those looking for a home in a master-planned community, new construction house, or spacious established home with lots of surrounding greenery are well suited to begin house hunting in the exquisite south east. Offering a refined, country-style living experience close to city amenities, Southeast Kelowna real estate provides a rare balance of both worlds. If you're ready to find the perfect detached home in this gorgeous corner of Kelowna, you've come to the right place. Explore all Southeast Kelowna real estate listings right below. Or, keep on reading about Southeast Kelowna homes for sale and the wonderful, relaxed lifestyle in this peaceful community. For boundless online search options, sign up for an account with VantageWestRealty.com. You'll be able to view exclusive listing information, save your search criteria, and receive the latest updates on the Southeast Kelowna homes you're interested in! Southeast Kelowna homes for sale are great for anyone hoping for a little more space and scenery than is offered by a typical downtown. Homes here benefit from the vast amounts of space by offering large lots, open floor plans, and only the best features of pastoral life. Detached residences are most common in Southeast Kelowna, with condo communities being more commonly available in other parts of the city. This area is best for buyers with the desire for natural landscapes and sumptuous privacy. Homes in this area are quite diverse. Many flock to the area in the hopes of securing a home at one of the planned communities, such as Gallagher's Canyon which surrounds its own impressive golf course. This self-titled "lifestyle community" delivers luxurious village-style living with a distinctive resort feel. Views of Scenic Canyon and the unique Layer Cake Mountain define the landscape while grand custom homes line the exclusive roads. Residents enjoy a "town & country" inspired lifestyle with access to pristine amenities. Other housing options in this area include large, beautiful homes on wooded lots built throughout the late 20th century. These typically price from the $500,000s upwards. 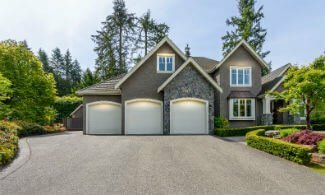 Lovely suburban mid-century homes and newer traditional stucco houses with European finishes are fantastic for family living. As Southeast Kelowna homes move into the $800,000s and $900,000s, the area's rural appeal becomes even more apparent. Expansive and elegant farmhouses and acreages in this price range boast multi-acre parcels, in-ground swimming pools, pavilions, private forests, long winding driveways, spa-style bathrooms, and panoramic views. Lush horse paddocks, charming picket fences, stables, rolling meadows, and wrap-around porches add rustic charm to these incredible high-end homes. Expect envy-inducing bonuses such as heated saltwater pools, hardwood floors, and chef's kitchens. Revel in soaring ceilings, expert architecture, indoor gyms, and world-class, hand-picked designer finishes. Plus, enjoy incredible landscapes and unspoiled nature, all awaiting you outside the gates of a Southeast Kelowna estate. Residents of Southeast Kelowna real estate enjoy the advantage of living near plentiful amenities. The area is home to many hobby farms, orchards, and five amazing wineries. It is also known for two of Kelowna's top golf courses: The Harvest and Gallagher's Canyon. Regional and provincial parks are easy to get to, making memorable weekend outings as easy as pie. Excellent pubs and restaurants are scattered throughout the area, and even residents of downtown occasionally head to this area to enjoy a scenic meal. Fantastic schools are close to many Southeast Kelowna houses, and the city centre is just a relaxing 15-minute drive away. Connect with Southeast Kelowna real estate experts at Vantage West Realty and find your dream Okanagan home today.